destroyers (DDG) will be named USS Paul Ignatius and USS Daniel Inouye. Tuscany, Italy, during World War II and later became a U.S. senator. defensive weapons designed to support maritime warfare. capable of operating at speeds in excess of 30 knots. Additional information about the Arleigh Burke class destroyers is available online at http://www.navy.mil/navydata/fact_display.asp?cid=4200&tid=900&ct=4 . EDITOR’S NOTE: MANY OF THE PREPARATION STEPS ERIK MENTIONS ARE JUST AS GOOD FOR OUR UPCOMING HURRICANE SEASON. OKLAHOMA CITY – Members of the Los Angeles Fire Department (LAFD) Command Staff are sent to assist those affected by the devastating tornado in Oklahoma City. On May 20, at 3:56 pm EDT, a tornado developed near Newcastle, OK (pop. 7,847) and swiftly moved ENE across Moore (pop. 56,315) before dissipating at 4:36 pm EDT. The tornado was reported to be a mile wide with winds of at least 166 mph creating widespread damage and casualties. In support of the national response to the events that occurred in the Oklahoma City Metropolitan areas of Moore and Newcastle, two members of the Los Angeles Fire Department’s Command Staff have been activated and are being sent to Oklahoma as members of FEMA’s overhead command team. California Task Force One (CA-TF1) has not been activated. However, LAFD Urban Search and Rescue Teams are standing by. 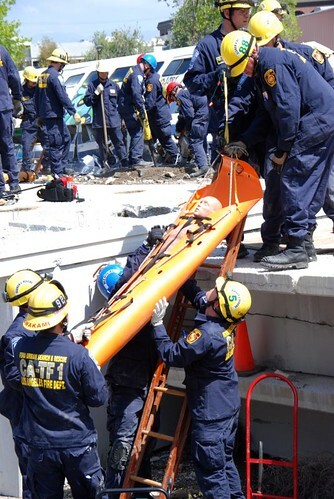 For more than two decades, the Federal Emergency Management Agency (FEMA) has helped organize and support a system of regional Urban Search and Rescue (USAR) Task Forces available for mobilization by State and Federal government on an as-needed basis. Comprised of specially trained and equipped local firefighters and other certified responders, this nationwide network of 28 FEMA USAR Task Forces includes eight in the Golden State, two of which are maintained here in Los Angeles County (CA-TF1: Los Angeles Fire Department (LAFD) & CA-TF2: Los Angeles County Fire Department (LACoFD), similar sounding but separate organizations). The LAFD along with FEMA urge residents in impacted areas to listen carefully to instructions from their local officials and take the recommended protective measures to safeguard life and property while response efforts continue. Listen to state, local and tribal officials who ask you to remain in shelters, homes or safe places until they give the “all clear” to travel. Roads are very likely to be damaged or blocked by debris, and traffic jams slow emergency managers and first responders as they attempt to reach hard-hit areas. We encourage individuals in the affected areas following a disaster to monitor local radio, TV stations, the National Weather Service at www.weather.gov or a NOAA weather radio for the latest weather and emergency information. We strongly remind all that NOW is the time to get prepared for tornadoes and other disasters such as earthquakes that threaten the Los Angeles area. There are tools and resources available online to help you prepare for, respond to and recover from any type of disaster. Visit www.ready.gov to learn more. The Spanish language site – listo.gov. Those with a Blackberry, Android or Apple device can download the FEMA app to access safety tips, shelter locations, and more. Member’s of the Los Angeles Fire Department hearts go out to those affected by the devastating tornado and we tip our helmets to all First Responders, particularly those bravely assisting in Oklahoma this week, which is National Emergency Medical Services Week (May 19-25, 2013). Many are surprised to learn the Los Angeles Fire Department commenced ambulance service in 1927. In the decades that have followed, the LAFD has remained a proud provider of Emergency Medical Services (EMS) across what is now a 470 square mile jurisdiction and home to nearly four million people that live, work and play in Los Angeles. This year’s theme, “EMS: One Mission. One Team”, marks the 40th annual National Emergency Medical Services Week from May 19-25, 2013. This is not only an opportunity to affirm our long-standing commitment to EMS, but more importantly to applaud the less visible members of a national EMS system that seek to assure the comfort, recovery and survival of all who turn to them when afflicted with sudden illness or injury. This week, we proudly recognize the around-the-clock devotion of 9-1-1 dispatchers, emergency medical technicians, paramedics, nurses, physicians, hospital technicians and support staff who work alongside us in a noble pursuit. It is our hope that you will join us this week in reaching out to the providers of EMS in your community, not only to say thank you, but to allow them an ability to better understand your needs and concerns related to emergency health care. Earlier this month your Los Angeles Firefighters instructed Hand’s Only CPR to hundreds who visited seven LAFD Fire Stations. Due to the positive feedback from participants, the LAFD will host a free “Sidewalk CPR” event at various locations throughout Los Angeles on June 4th, 2013 where you will have an opportunity to practice this life saving skill on mannequins. We look forward to providing you with more details on this exciting upcoming event soon. Today the Internet Crime Complaint Center (IC3) released the 2012 Internet Crime Report—a summary of reported fraudulent activity, including data and statistics. In 2012, the IC3 received and processed 289,874 complaints, averaging more than 24,000 complaints per month. Unverified losses reported to IC3 rose 8.3 percent over the previous year. A new section in this year’s report includes charts for each of the 50 states detailing demographic, complaint, and dollar-loss data. The section allows for easy comparisons and convenient reference. Additional content includes frequently reported Internet crimes, case highlights, and graphs that explain the lifecycle of a complaint. The most common complaints received in 2012 included FBI impersonation e-mail scams, various intimidation crimes, and scams that used computer “scareware” to extort money from Internet users. The report gives detailed information about these and other commonly perpetrated scams in 2012. The IC3 works to educate the public and law enforcement about fraud trends. IC3 is a partnership between the Federal Bureau of Investigation (FBI), the National White Collar Crime Center (NW3C), and the Bureau of Justice Assistance (BJA). Since its start in 2000, the IC3 has become a mainstay for victims reporting Internet crime and a way for law enforcement to be notified of such crimes. IC3’s service to the law enforcement community includes federal, state, tribal, local, and international agencies that are combating Internet crime. IC3 receives, develops, and refers criminal complaints of cybercrime. IC3 gives victims a convenient and easy-to-use reporting mechanism that alerts authorities of suspected criminal or civil violations. For law enforcement and regulatory agencies at the local, state, federal, and international levels, IC3 provides a central referral mechanism for complaints involving online crime. The U.S. Department of State has commissioned a new memorial to honor personnel who lost their lives while supporting overseas criminal justice assistance programs. These criminal justice advisors, including police, corrections, and support staff will now be honored through a permanent memorial housed at the Department’s Headquarters. The memorial to the fallen advisors commemorates 86 personnel who lost their lives between 1989 and 2012 while supporting U.S. Department of State criminal justice missions abroad administered by the Department of State’s Bureau of International Narcotics and Law Enforcement Affairs. Most of the personnel died supporting missions in Iraq (28), Peru (18), Afghanistan (15), Colombia (14), and Bosnia (5). The memorial honors all personnel, regardless of nationality, who died while supporting INL’s criminal justice programs. Sixty-seven U.S. citizens are listed alongside 19 non-U.S. citizens. The U.S. citizens hailed from 26 different states. Most of the personnel memorialized on the wall were contract employees; others include U.S. Federal Agents. Many of those killed were former police officers, corrections officers, support staff, security professionals, and drug eradication pilots. Many of the contract employees were employees of DynCorp International, Engility Corporation, Pacific Architects and Engineering and Civilian Police International. The wall itself measures 54”x36” and consists of a glass panel with the world map etched on it. On top of this large glass panel are three individual panels with the names, dates of death and location of death of the honorees. For further information, please contact INL-PAPD@state.gov. For the past three years, the U.S. Department of State has made a sustained effort to recruit state and local law enforcement, corrections officials, prosecutors, and judges to participate in our criminal justice assistance programs abroad. Through trainings and exchanges, our partners are helping foreign law enforcement personnel undermine criminal networks where they develop and helping reduce criminal threats both in the United States and in our partner nations. The Department of State has forged partnerships with more than 50 federal, state and local criminal justice agencies in 25 states over the past three years. The program is managed by the Bureau of International Narcotics and Law Enforcement Affairs (INL). Establishing linkages between U.S. domestic law enforcement agencies and their international counterparts addresses the need for greater cross-border cooperation to counter the increasingly global and complex and global nature of criminal threats such as money-laundering, transnational organized crime, and terrorism. Programs to train and mentor foreign criminal justice personnel are key U.S. Department of State foreign assistance priorities. A goal of these programs is to improve the ability of other nations to become effective global partners in combating crime, thereby reducing crime within U.S. borders as well as abroad. Since 2010, with funding provided by the Department of State, dozens of U.S. local and state police officers from six states have deployed to seven countries. Among the program participants is the New York Police Department (NYPD), which has supported 12 deployments to Haiti over the past three years. Sixty-eight Creole-speaking NYPD officers have rotated through Haiti to train and mentor their Haitian counterparts on community policing, police patrol operations, and investigations. The NYPD deploys six active-duty Creole-speaking police officers every four months to serve on 90 to 120-day rotations in various Haitian cities. State and local partnerships are mutually beneficial. The Department of State benefits by tapping into the unique skill sets, knowledge and expertise of active serving police officers, corrections officers, and legal professionals. State and local partners expand their ties to countries with which their communities have links, develop new skill sets, and represent their country. Host country counterparts benefit from working with active-serving U.S. counterparts and learning their proven law enforcement methods. Most importantly, these partnerships create people-to-people connections and foster lasting relationships between U.S. law enforcement and criminal justice sector actors and their counterparts in nations receiving U.S. assistance and training.